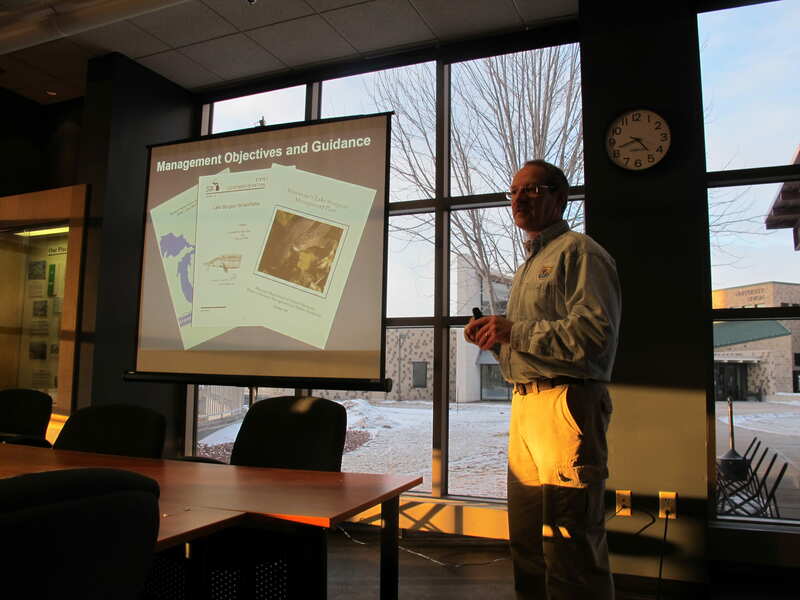 This week, we had Steve Fajfer from the WI DNR Wild Rose Hatchery in to talk with us about the role of fish propagation in fisheries management. Steve is the hatchery supervisor, and he has worked for the DNR most of his life – between 30 and 40 years. He was involved in a huge renovation project of the hatchery which took about 20 years to complete. The hatchery now regularly raises the following species: walleye, northern pike, musky, lake sturgeon, brown trout, Coho & Chinook salmon, and occasionally a few others. Wild Rose is the only hatchery in Wisconsin to raise lake sturgeon. The hatchery consists of different types of tanks to accommodate the habitat needs of each fish, such as netted cool & cold water ponds and indoor raceways. All the funding for the hatchery and its employees comes from fishing license sales, which is pretty neat. The entire process of raising fish is pretty complicated. Once the eggs are extracted, they are incubated in separate compartments. Millions of eggs are sort through by hand, separating live from dead eggs. Eggs are treated with iodine beforehand to disinfect and minimize pathogens. Different water systems accompany the fish as they grow. For example, they use recirculating water and a heater system for the coolwater fish, and simple gravity flow for coldwater fish. When the fish are moved to outdoor ponds, they are fed minnows so that they grow faster. However, this type of harvest is labor intensive and minnows are vectors for many diseases, so this may also harm the fish. Species are released into lakes and streams at various times depending on their ideal stock size. This is a pretty broad outline of the process, and it is important nothing goes wrong – fish are seasonal breeders, meaning they can’t ‘start over’ with a year class if it isn’t raised properly. Last week Thursday, Steve Stoinski came to talk with us about his career as a special agent working with through US Fish and Wildlife Service. Steve spent time working in a few different states (Alaska, Utah, Colorado) before landing the job that he has now. He has held positions as a legislative coordinator, field training officer and pilot, as well as his current position as a conservation warden. As a special agent, Steve is responsible for coordinating efforts with foreign, state, and tribal governments, providing investigative training and educational programs, responding to natural disasters (Hurricane Katrina, BP oil spill), and last but not least, enforcing federal laws. One of the big ones is the Lacey Act, which gives him inter-state and foreign commerce enforcement ability. Under this act, Steve has worked undercover to take down illegal operations involving various wildlife hunting and/or poaching (deer, bear, mountain lion, etc.). The Marine Mammal Act is another that authorizes indigenous/native people to hunt marine mammals, but only if it’s subsistence hunting. Some of the other Acts he has worked in the name of include the Endangered Species Act, Bald and Golden Eagle Protection Act, Airborne Hunting Act, Migratory Bird Treaty Act, and a few Multinational Species Conservation Acts. Last summer, Steve was asked to help with an international training session in Botswana, Africa. He went over to help investigate elephant and rhino poachers, and he taught the participants how to catch poachers and how to work with others to best maximize their efforts. 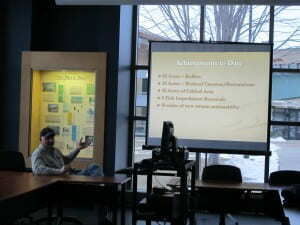 Steve’s talk was highly informative and very educational. It is good for us students to get a broader perspective on wildlife and our natural resources, especially those of us wanting to work in the field some day. 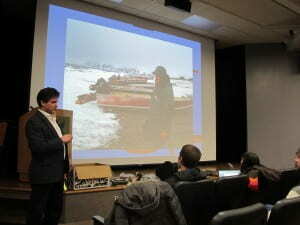 This past Thursday, Dave Boyarski came in to talk with us about commercial fisheries and management on Lake Michigan. Dave works for the Sturgeon Bay DNR as a fisheries supervisor. He briefly went over some history of commercial fishing operations in Lake Michigan. Historically, lake trout and burbot were the dominant predators in Lake Michigan, along with many near shore fish communities, cisco and lake whitefish populations. Today, we have a huge alewife population that makes up a large part of the fishery, as well as sea lampreys and many other invasive species. In effect, tributaries and near shore wetlands have become polluted and degraded, with drastic effects on the fish communities. 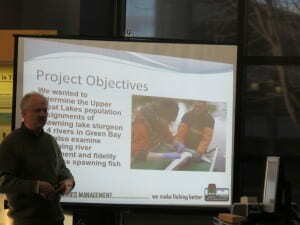 On Thursday, February 5th, Rob Elliot was our guest speaker, and he chose to talk about lake sturgeon passage on the Menominee River. He is currently involved on a project that focuses on successfully getting lake sturgeon up past the first two hydroelectric dams on the Menominee River. This project has been in the works for roughly 15 years, and he is excited to see it finally being carried out. The Menominee River is the first location where there will be substantial structures put in place specifically for sturgeon passage, possibly worldwide. Lake sturgeon used to be in the Great Lakes in great abundance, and even considered a nuisance fish at one time. Their numbers drastically declined when people realized that the adults and eggs were quite tasty. Their population dropped significantly within 20 years from overfishing and habitat degradation. The Menominee has the highest abundance for spawning populations (~1,000 out of ~3,000 total lake sturgeon in Lake Michigan), yet the fish cannot make it up past the first dam to the most successful spawning habitat. The area they can access, the mouth of the river, consists of mostly adult populations because the larval fish are unable to make it back out to the bay if hatched further upstream. If lake sturgeon were able to make it past the first two dams in the river, they would have access to roughly 6 million m of juvenile habitat, crucial for the populations’ success. It seems as though when larvae hatch below the first dam, they get washed out into the bay too early and do not survive. Therefore, a fish elevator is currently being constructed on the first dam to collect the lake sturgeon who enter the river, and transport them upstream so they can be released past the two hydroelectric dams. Bypass gates are also being constructed to protect the fish from the turbines and guide them through with safety. The overall effects of this project may not be realized for a few years, but a successful outcome could prove crucial for the lake sturgeon population. On Thursday, 2/5/15, Dave Boyarski from the Sturgeon Bay DNR will be coming in to talk with our AFS group about Lake Michigan commercial fishing management. Dave is the northern Lake Michigan fisheries supervisor. Our meetings are held at 4:00pm in MAC 201. We hope to see you there! On Thursday, 2/5/15, we will be having guest speaker Rob Elliot in from the US Fish and Wildlife Service. Rob is a fisheries biologist, and he is the lake sturgeon coordinator at the Green Bay office. He will be talking about the development of fish passage for lake sturgeon on the lower Menominee River, specifically around the hydroelectric dam. There is a lack of access to upriver habitats for lake sturgeon, and this is believed to be limiting the successful reproduction and growth of the sturgeon population in the Menominee River. He is working to reestablish a migration route around the two lower dams that will hopefully increase abundance of the lake sturgeon population. Our meetings are at 4:00pm in MAC 201. Hope to see you there! 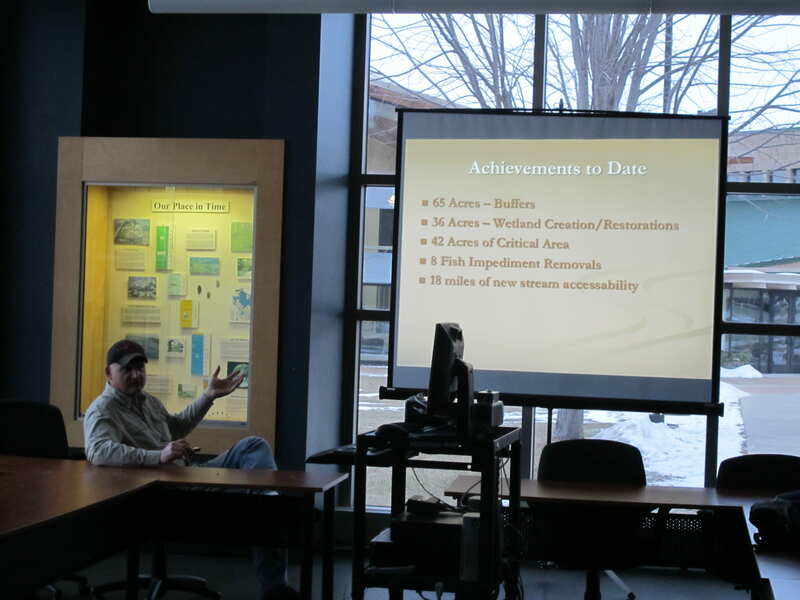 At our AFS meeting last week, Mike Mushinski from the Brown County Land & Water Conservation department came in to talk about northern pike restoration projects he is involved with. He is currently involved with a west shore YOY and adult monitoring project that has been going on since 2003. Green Bay proper has a poor habitat for these fish, and Mike is focusing on small, intermittent streams and wetland complexes to study them. Due to habitat degradation, there has been a significant decrease in northern pike populations. This is mostly because the pike do not have a place to spawn where their larvae are successfully able to make it out to the bay. Northern pike are not a species that needs assistance in reproducing – they do fine with that. What they need is a place for successful reproduction. They require small ephemeral wetlands, lots of vegetation, and shallow waters for a significant amount of time. Part of the project includes setting out wooden box traps to catch the YOY northern pike migrating back out to the bay. The pike were counted and measured, and then released. This data has shown that within the last 3-4 years, populations have increased substantially. It was also found that many other species utilize these wetlands, including black bullhead, suckers, shortnose gar, bowfin, yellow perch, and many minnow/shiner species. Another significant part of this restoration project is creating barriers, or water control structures, to hold water in a spawning site. This is a way to keep water levels up so that the ichthyoplankton can develop and the young-of-year fish can migrate out. One initial positive to this study is that northern pike do not use natal homing to return to the stream they were spawned in, so that means that they may be more likely to utilize these restored areas for reproduction. Our first meeting back from winter break will be held this coming Thursday, 1/29/15, from 4:00pm-5:00pm. Mike Mushinksi will be our guest speaker. He works for the Brown County Land & Water Conservation, and he is in charge of the west shore pike habitat restoration project. He will be sharing on how the project is progressing, and also his involvement in other restoration projects in the area. This coming Thursday we will be having guest speaker Erin Wilcox in from N.E.W. Water to attend our AFS meeting. She will be presenting on her educational and career background, what she is currently involved with regarding N.E.W. Water’s water quality monitoring program, and a summary of some of the recent data they have collected. We hope to see you all there at 3:00pm! This past Thursday, we had Mike Donofrio, the fisheries team leader from the WDNR come in the talk with us on what he is currently involved with regarding lake sturgeon. The DNR is measuring the lake sturgeon spawning fidelity to Green Bay rivers – where they spawn and whether it is the same location as where they hatched. They wanted to do some research with genetic structuring to create a genetic tree of populations and genetic similarities. Of the total lake sturgeon population in Lake Michigan, 75% of their spawning activity occurs in the bay of Green Bay, and 50% of the total occurs just in the Menominee River. The process of tracking the species begins by anchoring a sonic transmitter and receiver into the sediment of each river. This transmitter has a cone-shaped signal whose radius reaches both banks of said river. It has a Bluetooth that accounts for each passing fish, and this is how each fish is noted. Later on, they go back through the data to make sure a single fish hasn’t passed more than once, and therefore counted more than once. They track the fish by using a VEMCO tag, inserted in the fish to track movement. Between 2011 and 2014, during the months of April & May, they capture the lake sturgeon by electroshocking and using dipnets. So far they’ve found that many fish, when not spawning, are transitory between river systems throughout their life, and many do not report back to their river of origin. Some actually stay within the same river throughout the year. Usually it was the males and not females who would return to spawn. Data will continue to be collected on this subject for some time yet.